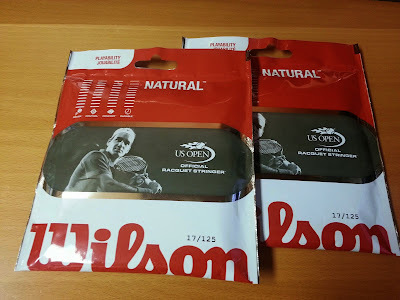 The King of Natural Gut - Wilson or Babolat? On the other hand, if your strings are breaking too frequently - consider trying a polyester string or at least use a thicker gauge tennis string. 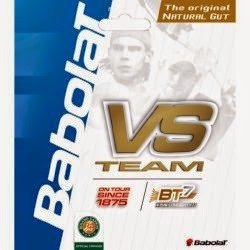 In recent years, Babolat has annouced that they started adding a new flavor of gut manufacturing (called Bt7). This provides an additional coating to help with thermal and humidity issues. "Thermogut coating, the new BT7 treatment claims to increase longevity by up to 15%, increase durability by 25%, and improve the resistance to humidity by nearly 60%"
However, a few tennis forum posts have complained that this coating changes the feel and quality of the gut. Therefore in play testing both, we found that the prices are relatively equal - the Wilson Natural Gut 17g gives you a better feel of the ball. It is designed to be free of defects and has a slight resin feel that makes it slide a little easier. Up close you can also make out an almost indistinguishable natural organic smell to the strings. While the Babolat may be better in very humid conditions, we found that they both lasted approximately the same amount of time before fraying and finally break (after 1-2 weeks of continual play). We used Natural Gut on the Mains of our racket and a control Polyester on the Crosses. This arrangement highlights the Gut's characteristics of play the most. The impressiveness of a Gut string on the mains is that the spin on the ground strokes is unbelievable when hit properly with correct technique and timing. Attempting a direct comparison using one racket with a poly main of Cyber Flash and the other with Natural Gut (using the same Luxilon Ace 18 cross strings), the difference was night and day. Drop shots were much more spectacular based on feel and touch. Much fewer mishits according to my opponent and seemed like I was hitting a level above on ground strokes. For optimal performance, the key is using Gut on the Mains, and a poly on the Cross. This also saves you a bit of money as you are only using half a set of Gut each time it is strung. Using it the other way around (with the Gut on the crosses), the difference between a full poly bed was not sufficient enough of a difference and way too expensive. The volleys were a bit softer with Gut crosses and you're less susceptible to what I call "poly elbow". But at the end of the day, there are better ways to create a more comfortable bed of strings without wasting your Gut. Watch the Science of creating Top Spin in Tennis (video) and Read our RPM Blast Comparison Review.